Your kitchen/dining room is the heart of every home. It’s where a family comes together to sit down after a long day. It’s where you share a first ‘good morning’ with your loved ones. It’s where you earn your way to your man’s heart. It’s where you put together a hearty meal for the party you’re hosting. Being the space, you spend lots of time in, it’s a worthwhile investment. We have teamed up with kitchens Newcastle experts at Bespoke Interiors to give you ideas for your future luxury kitchen! All kitchens need storage space to store pots and pans, spices and cupboard produce. Investing in beautiful fitted cabinets means a beautiful and cohesive style with no ugly clutter. Choose luxury materials that will complement the overall theme of your kitchen – blackened stainless steel or burled mahogany are especially popular this season. For more traditional look opt for hand painted Oak or Walnut. Open shelving farmhouse-style kitchens are becoming increasingly more popular for adding a homelier feeling to your kitchen. These kitchens usually have an accent wall of fitted wall shelving for all the storage needs. Leaving the rest of the space for appliances and worktops. A minimalistic design might not be everyone’s cup of tea when it comes to interior design. By keeping the design aspects of your kitchen minimal, you can really focus on investing in state-of-the-art materials and high-end appliances. If you’re working with a small space – minimal interior, designed with functionality in mind, might be the best solution. Open plan kitchens are an excellent way to connect your indoors with your outdoor area – think continues flooring and sliding doors. Especially lovely in the summertime for dining or hosting outdoor gatherings. Consider an island unit in the middle of space to separate the dining area and the kitchen area, without adding a wall. This will add you some extra storage space but also can be doubled as a bar top when you have guests over. Sometimes the small things make the most significant difference. 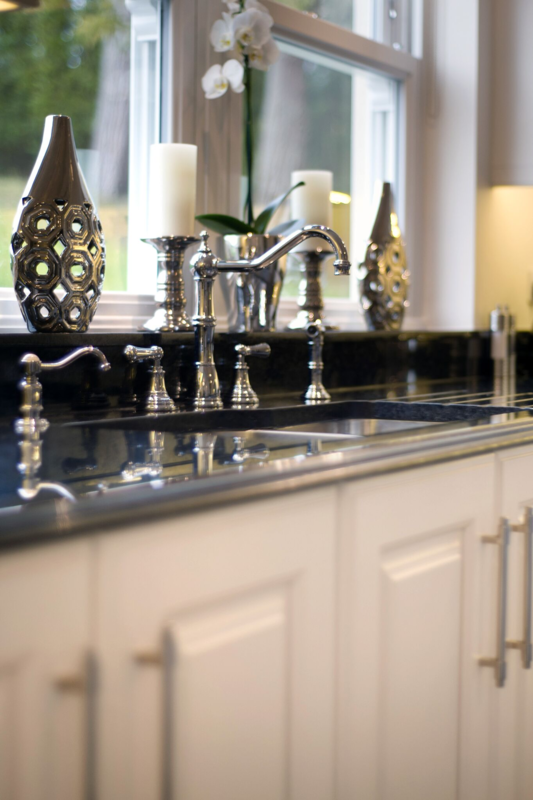 Choose beautiful handles for your kitchen furniture, that will add value to your kitchen rather than decreases it. Choose designs and finishes based on the overall style of your kitchen uniquely handcrafted to your needs. 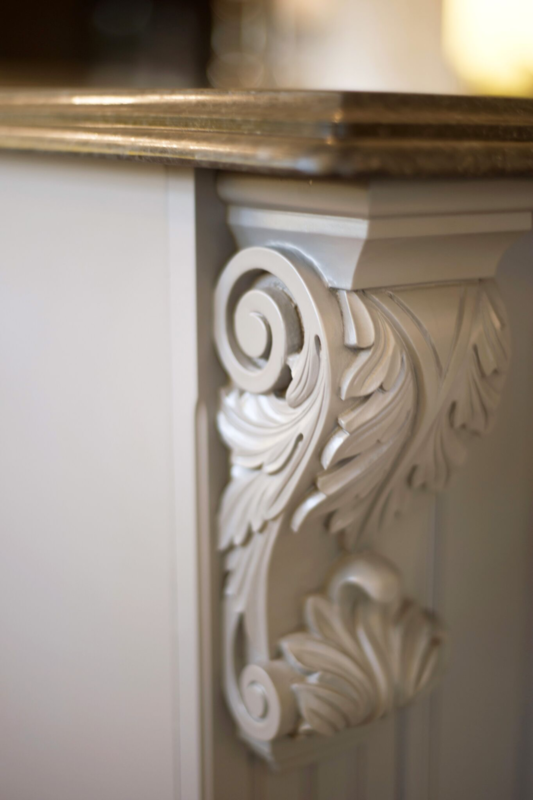 Add understated elegance to your kitchen with acanthus corbels as countertop support for an extra detail that will elevate the interior design. 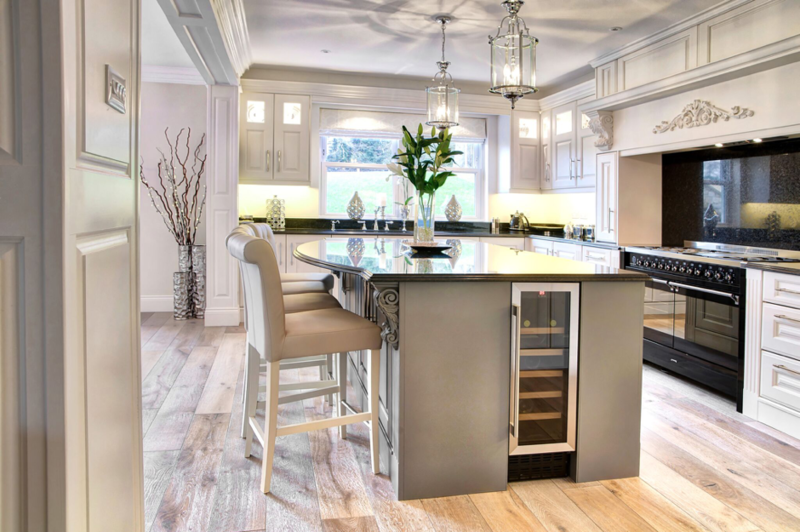 Creating a luxurious kitchen is more than using the finest materials available. It’s about creating a bespoke design that will fit in your home, carry elegance and have the ‘wow’ factor.